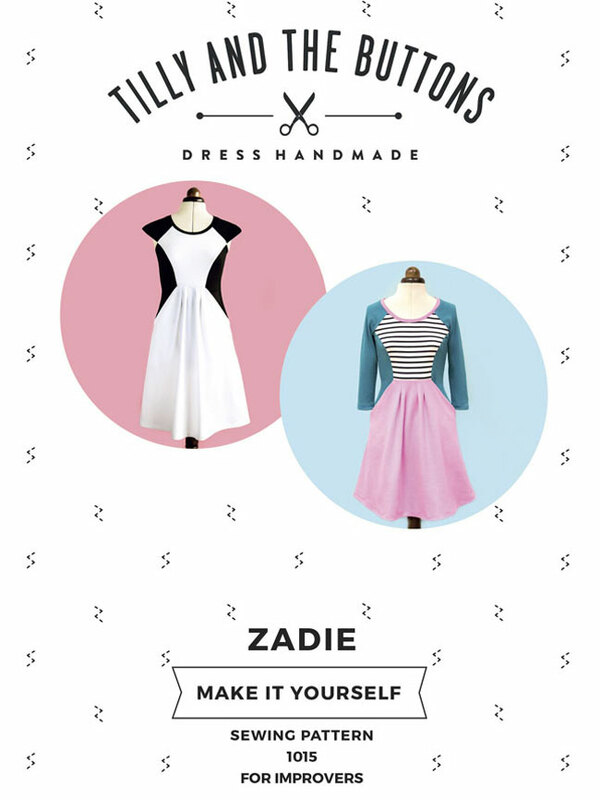 Tilly and the Buttons: Meet the Zadie dress pattern! 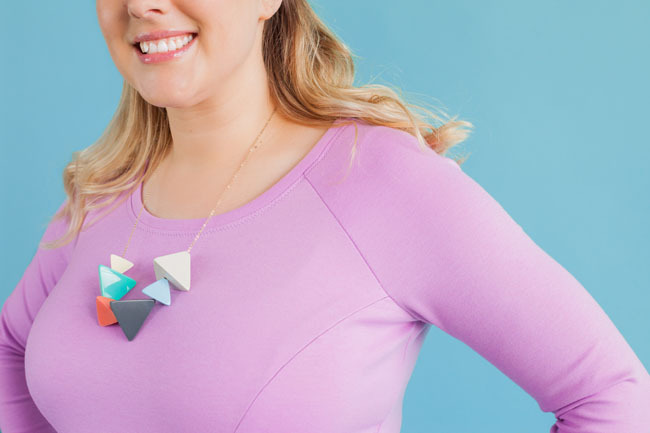 Today’s a good day – a brand new sewing pattern is here, and it’s a beauty! Zadie is my favourite kind of dress – one of those dream outfits that make it easy to get dressed in the morning. Designed for knit fabrics such as ponte and jersey, Zadie is stylish and comfortable at the same time. Throw it over your head at the weekend to curl up on the sofa, or dress it up a necklace and heels for a meeting or date. Grab the sewing pattern – or get one of our limited edition kits with the fabric, thread and stabiliser included! 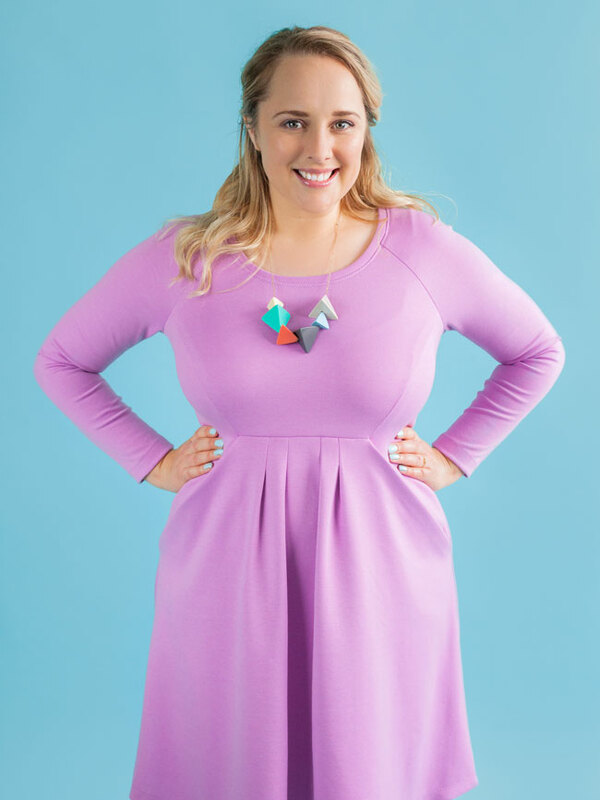 My favourite feature of the Zadie dress is the striking Z-shaped seams – flowing from raglan sleeves, along the bodice, and into the skirt, on both the front and the back. The icing on the cake is that the diagonal seams on the front skirt conceal every stitcher's favourite detail - pockets! The bodice is close fitting, with a round neckline finished with a neckband, and an empire waistline designed to sit between your high waist and the bottom of your bust. The dress then flares out into a flattering (waist-skimming! ), feminine, semi-pleated skirt that ends at the knee. You can wear Zadie in all weathers thanks to the choice of long, three-quarter length or cap raglan sleeves. 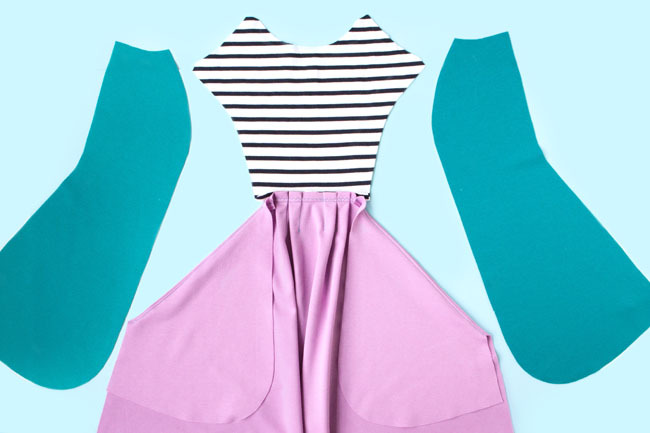 Make it all in one colour, or get creative with colour blocking! It looks particularly flattering with darker side panels and sleeves. Look out for a forthcoming blog post full of tips for colour blocking your dresses. Making Zadie is a bit like piecing together a puzzle – in a good way! The unusual style lines come together to form a satisfying project that will take your garment construction skills beyond the basics. If you’re a fan of the Coco or Agnes sewing patterns, Zadie is a great next step to develop your experience sewing with knit fabrics. 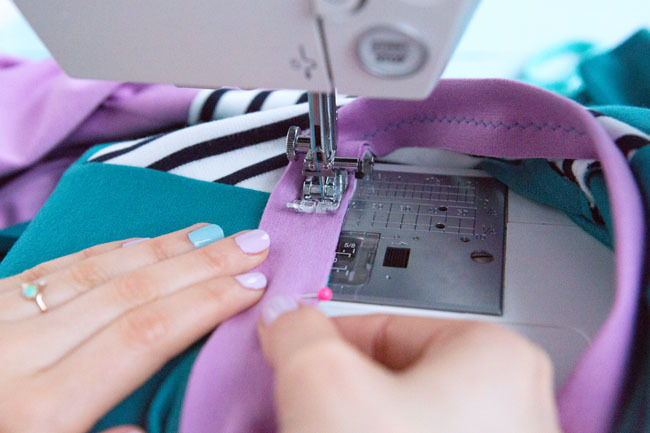 You can make it on a regular sewing machine – an overlocker or serger is completely optional. If you haven’t sewn knit fabrics before, I’d recommend taking my video workshop, Learn to Sew Jersey Tops, to get to grips with stitching techniques and pick up tips and tricks. We’ve put together limited edition Zadie sewing kits with everything you need to make the dress – lovely ponte di roma fabric, matching thread and satin ribbon to stabilise the seams. Kits are a great option if you’re not sure what fabric to choose or if you just want to make your life that bit easier! Kits are also very cost effective if you want to make a colour-block version but don’t want to have to buy each colour by the metre or yard. I’ve chosen colourways that I think look particularly gorgeous. 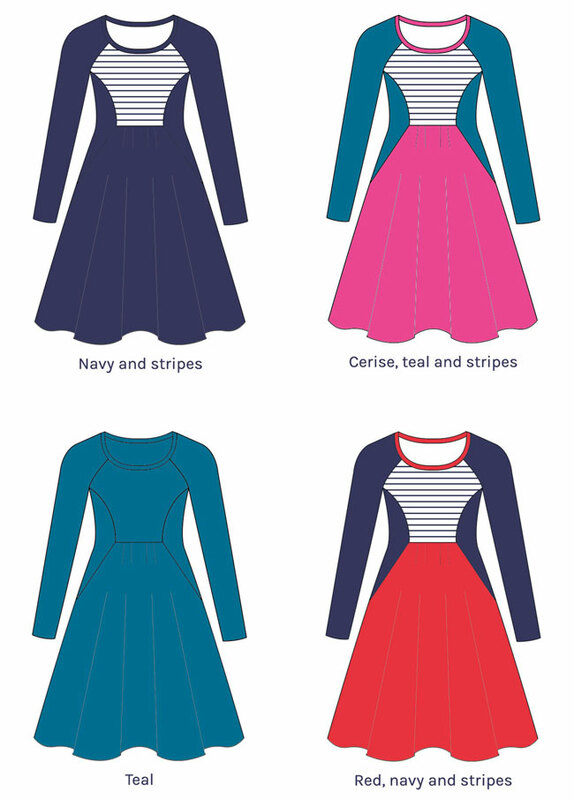 Choose from a nautical red, navy and stripes version; a cerise, teal and stripes dress which is similar to the one I demonstrate in the pattern instructions; navy and stripes for a bit more of a classic style; and solid teal that would look great worn with a bright necklace. These kits won’t be around forever – we’ve only got a limited amount of the fabric and won’t be able to get more for a little while. So if you want one, get it before it’s gone! We pride ourselves on making great patterns with easy-to-follow instructions that are a pleasure to use. (In fact, we won an award for it!) 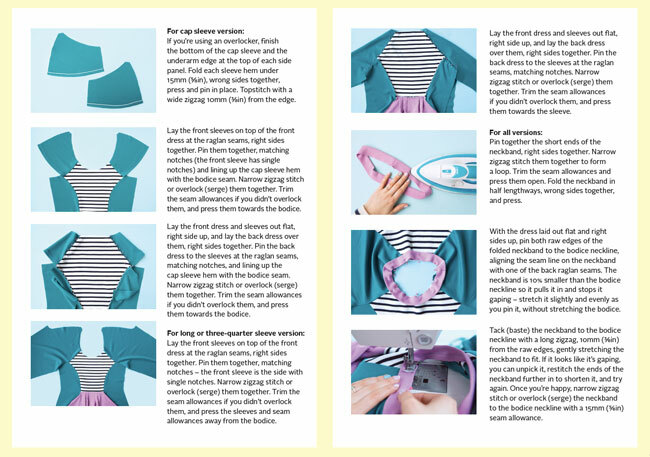 Each pattern comes with a full colour booklet with step-by-step photos showing you how to sew each part. Order the printed pattern and we’ll send you a gorgeous package in the post, printed on durable paper that doesn’t fly around the kitchen when you cut it out or scrunch up when you try to get it back into the envelope. Zadie is also available from fabric shops and departments stores around the world. If your favourite shop doesn’t stock it, remember you can always ask them to! The pattern includes eight sizes – from UK 6 – 20, US 2 – 16, or EUR 34 – 48. You can see the exact body measurements on the sizing chart. We've got a blog post coming up on choosing your size and making fitting adjustments – stay tuned for that one if you need help. If you want to choose your own fabric, look out for a medium weight stretch knit fabric such as ponte di roma, double knit, interlock, jersey. Check the fabric can be stretched crosswise at least 20% wider than its original width, and that it pings back down to size after stretching. Take a look at how much fabric you need and other supplies on the shop page – and scroll to the bottom of the page for amounts of fabric you’ll need for colour blocked versions. 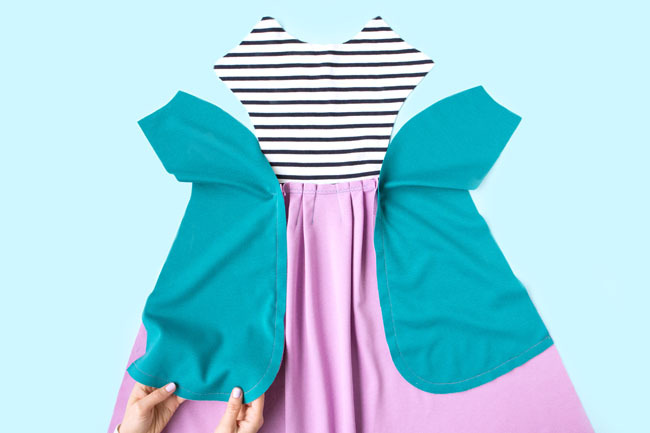 You can make the dress entirely on your regular sewing machine, as long as it has an adjustable zigzag stitch. If you have an overlocker or serger, you can use this when stated in the pattern instructions (don’t worry if you don’t have one, it’s not essential!). Extra good news – we’re having a sewalong! The unusual style lines on this pattern mean that you may not immediately recognise which seam is which and how the pieces go together. We always label the seams on our pattern sheets to help you see what's what, and we include colour photos in the instructions so you can see what it’s supposed to look like as you’re making it. Nonetheless I thought it would be extra helpful if I take you through the construction with even more photos and tips – so that’s what I’m going to do in the sewalong posts coming soon to this blog. I thought it would be most helpful to focus on construction for this sewalong. 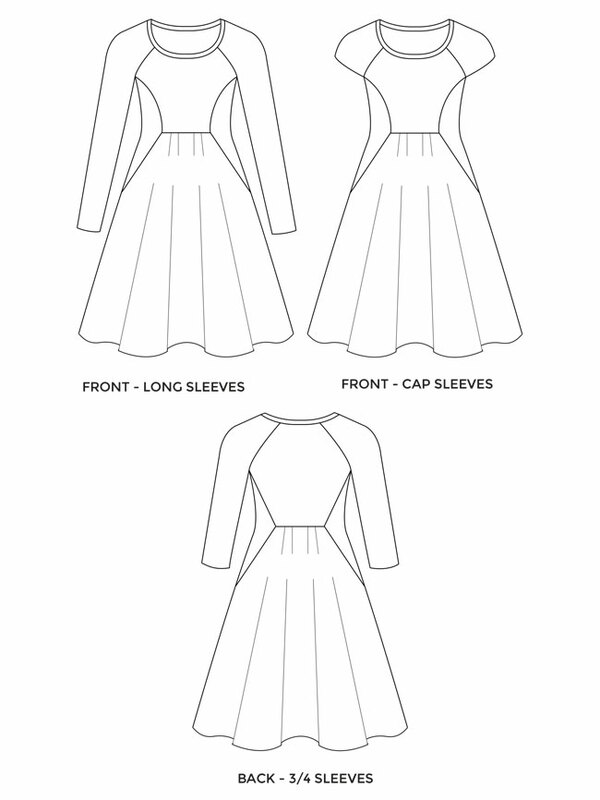 If you need help cutting knit fabric, take a look at this blog post I shared previously, alongside the cutting layout diagrams and instructions in the booklet. You can also download cutting layout diagrams for colour-blocked versions at the bottom of the shop page. If you need help stitching knit fabrics, I’ve included some tips in the instructions that come with the pattern. You could also take my online video workshop, Learn to Sew Jersey Tops, to get up to speed on the techniques.